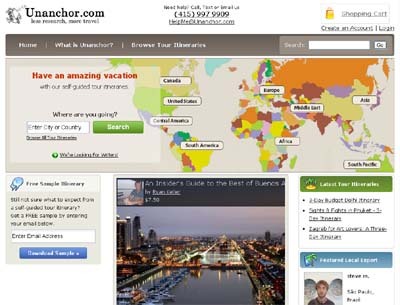 Unanchor.com puts a new spin on the traditional travel guide. Don’t want to deal with the hassle of researching? Looking for a unique way to see a city? Unanchor self-guided tour itineraries give you the information to be your own tour guide. They are the perfect solution for the busy traveler. Most guidebooks are not written by local experts. Guidebooks are far more comprehensive and overwhelming than the product we offer. They require a lot of research to still figure out what to do and how to get around. Searching online is an intimidating and difficult process due to the overwhelming amount of information. You never know whether something is an honest review. Our solution gives everything a traveler needs — what to see, specific directions & maps and local’s insider tips.